It’s been hot and humid the last several days. Something cold and quick is very appealing for snack or a light little dessert. Healthy besides is even better. 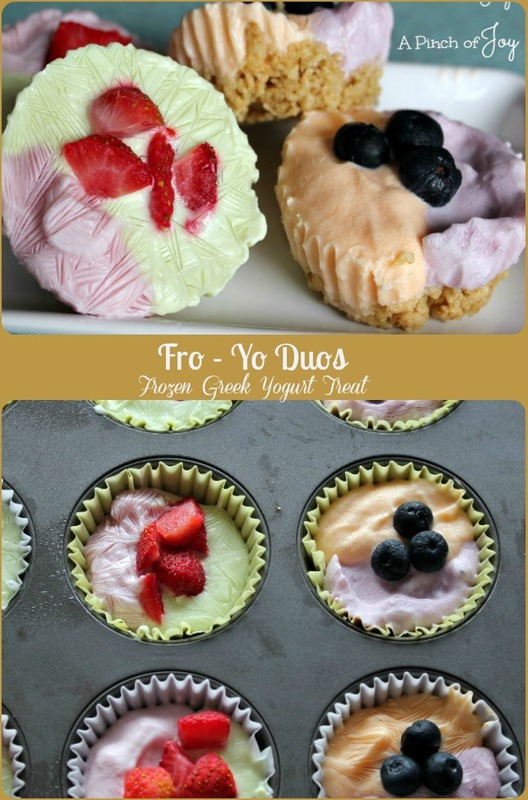 These Frozen Yogurt Duos fill the bill, with a combination of yogurt flavors and a light crust. So easy to make, the kids can do it! Crush the cereal by filling your measuring cup and then pressing down tightly. Repeat until you have one cup crushed cereal. Melt the butter in the microwave – about 20 seconds works in my microwave. Mix the two together in a small bowl. When mixed divide evenly amongst twelve cupcake liners placed in regular sized muffin tin cups and press in firmly. I pick our yogurt by the number of carbs in a serving. I’m looking for around ten carbs in a one serving container. This time I used Dannon Light & Fit 80 calories Greek yogurt. They are nice and thick and will stay on their side of the cupcake wrapper. You end up with a pretty to see division and you can savor each flavor, as Wheels says. Dannon didn’t have a key lime so I used another brand which was not as thick. Some other brands with lower carb counts are Yoplait Greek 100 calories, Great Value Light, Carbmaster and Kroger. Just be aware that different flavors of Greek yogurt can have varying carb counts even in the same brand, so be sure to check them out before buying for the first time. Not counting carbs? Then you have free range of all the flavors to mix anyway you want! If you have difficulty with the thickness of Greek yogurt eaten out of the cup – it’s not an issue when the yogurt is frozen! It’s a plus — creamy goodness frozen. Line twelve muffin cups with cupcake papers. In small bowl mix crushed cereal and melted butter. Spoon a tablespoon of butter and cereal into each muffin cup and press firmly with rounded bowl of spoon. Spoon a teaspoon of strawberry yogurt into six of the muffin cups, keeping the yogurt to one side. Spoon lime yogurt into the other half of each of the six cups. Repeat for the other six cups, using blueberry and orange yogurt. Top the strawberry duo with chopped strawberries and the blueberry duo with three blueberries. Cover with plastic wrap and freeze for at least 2 hours until firm. To serve remove from pan and cupcake wrapper and let stand on serving plate or in small serving bowl for about five minutes. Store any remaining yogurt cups in resealable freezer bag or tightly sealed plastic container.